By: Keith Johnson & Timothy Larsen, eds. At the 2012 Wheaton Theology Conference, Bonhoeffer's thought and ministry were explored in stimulating presentations. Bonhoeffer's views of Jesus Christ, the Christian community, and the church's engagement with culture enjoyed special focus and the best of the conference is now available in this book Bonhoeffer, Christ and Culture. Throughout it is clear that in the twenty-first century, Bonhoeffer's legacy is as provocative and powerful as ever. Dietrich Bonhoeffer (1906-1945) was one of the most compelling and controversial theologians of the twentieth century. A complex mix of scholarship and passion, his life and writings continue to fascinate and challenge Christians worldwide. He was a pastor and profound teacher and writer on Christian theology and ethics, yet was also involved in the resistance against Hitler which plotted his assassination. Protesting the unconstitutional interference by Hitler of the established national Protestant church and the persecution of the Jews, and rejecting the alignment of the German Christian movement with the Nazi regime, Bonhoeffer became head of an underground seminary for the resisting Confessing Church in Germany. Bonhoeffer graduated from the University of Berlin and earned his doctorate in theology at the age of twenty-one. While pursuing postgraduate work at New York's Union Theological Seminary his life and ministry were profoundly influenced by his unanticipated involvement with the African American Abyssinian Baptist Church in Harlem during that time. Dietrich Bonhoeffer (1906-1945) was one of the most compelling theologians of the twentieth century. A complex mix of scholarship and passion, his life and writings continue to fascinate and challenge Christians worldwide. He was a pastor and profound teacher and writer on Christian theology and ethics, yet was also involved in the resistance against Hitler which plotted his assassination. Bonhoeffer graduated from the University of Berlin and earned his doctorate in theology at the age of twenty-one. While pursuing postgraduate work at New York's Union Theological Seminary his life and ministry was profoundly influenced by his unanticipated involvement with the African American Abyssinian Baptist Church in Harlem during that time. Protesting the unconstitutional interference by Hitler of the established national Protestant church and the persecution of the Jews, and rejecting the alignment of the German Christian movement with the Nazi regime, Bonhoeffer became head of an underground seminary for the resisting Confessing Church in Germany. At the 2012 Wheaton Theology Conference, Bonhoeffer's thought and ministry were explored in stimulating presentations. Bonhoeffer's views of Jesus Christ, the Christian community, and the church's engagement with culture enjoyed special focus. Throughout it is clear that in the twenty-first century, Bonhoeffer's legacy is as provocative and powerful as ever. Keith L. Johnson (PhD, Princeton Theological Seminary) is associate professor of theology at Wheaton College. His research focuses on systematic theology, including the doctrines of the Trinity and Christology and the relationship between Protestant and Roman Catholic theology. He is author of and coeditor of . An ordained Baptist minister, he and his wife Julie have one son. Timothy Larsen is McManis Professor of Christian Thought at Wheaton College. He has been a visiting fellow at Trinity College, Cambridge University, and All Souls College, Oxford University. His monographs include and, most recently, (Oxford University Press). 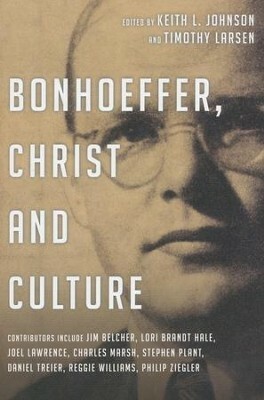 Bonhoeffer, Christ and Culture has its origin within the North American evangelical scholarly community, though not all its authors would identify themselves as such. What unites them is their deep appreciation for Bonhoeffer's life, witness and theology, the integrity of their scholarship, and their recognition of Bonhoeffer's continuing significance for the church in the twenty-first century. Having spent the past fifty years of my life engaged in dialogue with Bonhoeffer's legacy, I am delighted to be introduced to new perspectives and interpretations, and to learn again from those whose contribution to Bonhoeffer studies is now well established. I commend it to all who want to know Bonhoeffer better.
" Bonhoeffer, Christ and Culture has its origin within the North American evangelical scholarly community, though not all its authors would identify themselves as such. What unites them is their deep appreciation for Bonhoeffer's life, witness and theology, the integrity of their scholarship, and their recognition of Bonhoeffer's continuing significance for the church in the twenty-first century. Having spent the past fifty years of my life engaged in dialogue with Bonhoeffer's legacy, I am delighted to be introduced to new perspectives and interpretations, and to learn again from those whose contribution to Bonhoeffer studies is now well established. I commend it to all who want to know Bonhoeffer better." "It is challenging to bring a historical figure into discussion of current concerns, but the scholars in this volume are generally effective in indicating the continued relevance of Bonhoeffer's thought and ministry. Recommended for scholars and serious general readers with an interest in Bonhoeffer's life and thought." "By including studies on higher education, technology, vocational realities of today, spiritual disciplines, and the pattern of congregational life, the volume brings Bonhoeffer's theological questions into conversation with contemporary issues throughout the church and academy. Ten contributors open a new window into evangelical interpretations of his theology, giving a sense of how Bonhoeffer himself struggled as well as where the future of Bonhoeffer studies may be headed." "This volume provides an insightful treatment of multiple dimensions of work of Dietrich Bonhoeffer and it is a testimony to the ongoing viability of his legacy in the context of American Christianity." "The book has some penetrating insights and is a real contribution to the study of Bonhoeffer's life and thought. . . . There are parts of the book which will move anyone who reads them. For example, the final chapter ends on a wonderful high, by quoting the camp doctor who was present at Bonhoeffer's hanging: 'In fifty years as a doctor I have hardly ever seen a man die so entirely submissive to the will of God.' Whatever reservations we may have about Bonhoeffer's orthodoxy he was clearly a man who followed Christ at a great cost. He lived and died as he preached." "The bulk of the essays that make up this edited volume derive from the 2012 Wheaton Theology Conference of the same name, 'Bonhoeffer, Christ and Culture.' With several additions from other events and occasions, the result is a diverse and valuable collection of studies on the life and thought of the German Lutheran pastor and theologian Dietrich Bonhoeffer." I'm the author/artist and I want to review Bonhoeffer, Christ and Culture - eBook.